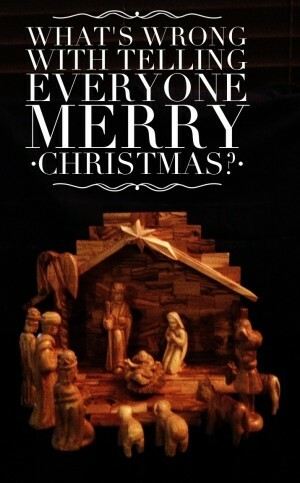 Why Shouldn't I Say Merry Christmas? Happy Holidays Isn't the Same! Every year I think about writing this blog post. But its hard to clear my head on the topic by the time I’ve seen a couple of rants. By now, some of you may be asking why I would care enough to write a post on the topic. There are a few reasons that I want to walk through one by one. I will openly admit to being a faithful person more than a religious person. Growing up, I was always at church. The relationships built there and the life lessons learned are a major part of who I am. I have continued my journey of faith with a lot of reading, experiences like travel to Israel, Turkey and the Vatican and a lot of introspection and discussion. Although I’m not a regular church goer, I find myself closely tied to the church and count many ministers among my family and dear friends. For Christmas, many years I have skipped putting up a tree, yet I have almost always put a nativity set out. I have a couple that I prize dearly. One that connects me to my mom & grandmom as it was a ceramic set the family made and the other that was carved from olive wood I purchased for myself when I was in Bethlehem a few years ago (featured in the photo here). “Merry Christmas” is a greeting that to me helps me offer a succinct connection to all of that in just a couple of words. When someone says Merry Christmas to me, it makes me smile and for a minute at least, it helps remind me of the reason for the season. For me, those words embody a certain spirit and love that I want to share. I have mentioned before that I grew up with what some friends have told me was a very unique experience. Early in life, I had family members who were Jewish. There was a time when our family included a Jehovah Witness and there are a few Buddhists in the family too. In high school and college I had a lot of friends who were from other parts of the world and who had different beliefs than me. So while my family went to a Christian Church during the Christmas season, I learned early that it wasn’t the same for everyone. And I learned it in a way that helped me respect the traditions that others had. Heck, despite our not being Catholic or Baptist, we frequently would be at events at those churches as well as our own. All of that is layered with an appreciation for the United States. We do a lot of things wrong here I will admit and I get into debates with family about what those things are. However, one thing we have had from the onset is the freedom to worship. To me, that right of freedom to worship based on personal choice is paramount. For me, there isn’t a question of whether I should say “Merry Christmas” or “Happy Holidays.” I want to bring a smile to people’s faces, to spread some joy. For me I need a combination of wishes that helps extend the joy and peaceful insight that I hope others see in the season and in me. It’s how I choose to respect others that has me saying a variety of phrases rather than just sending a Christmas wish. There are lots of reasons to be happy this time of year & they are all good. 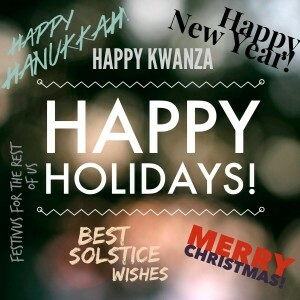 When I see Jewish friends during the holidays, I try to remember to tell them Happy Hanukkah as I truly hope they are having a great holiday season and pursuing their faith. With Buddhist and Hindu friends and family, I’m far more likely to focus on New Year’s wishes. And my friends of different faiths tell me Merry Christmas though they don’t personally celebrate it. For people I may not know well but would like to offer up a cheerful greeting, happy holidays works well. They could be celebrating Christmas, Hanukkah, New Year’s, the Solstice or simply celebrating a bit of time off as holiday. They may even being cheering “festivus for the rest of us.” My largest group of family & friends get the Merry Christmas! If someone wishes me Happy Hanukkah, I don’t assume they mean to offend me by failing to recognize the fact I’m not Jewish. They are simply wishing me well. But I also know that my saying “Happy Holidays” doesn’t take anything away from my faith or the spirit which which I celebrate anything, it simply shows I’m aware that others may be celebrating something else. And in that minute, I get to be the kind of person I want to be. The kind of person who respects other religions and cultures. For me arguing about which greeting I should use is counter-productive, I choose to celebrate the season instead! If you’d like a light-hearted look at the holidays, check out this post on the “12 days of Cotton.” Yes, I wrote cotton-based lyrics for a Christmas song. And yes, I recorded it! LOL. I hope you have a great one and don’t forget to make my favorite fiber part of it! Thanks Tiffany! I hope you have a fantastic holiday! Very well stated Janice! It’s a season of joy & happiness. My family celebrates the birth of Jesus Christ and I feel very fortunate to live in a country where I have the right to do so! Marry Christmas Kim! Hope to catch up with you soon! As someone who is Jewish, I love your perspective. My only issue is that people working in public businesses like grocery stores and restaurants should say Happy Holidays since they are representing the store, and not their own religion. And since they don’t know the people well, it’s the best way to express greetings while being respectful. I also say Merry Christmas to my Christian friends or to people who say it to me, as I am letting them know that I want to enjoy their holiday. I just wish that everyone saw it the way you do and understood that everyone doesn’t celebrate Christmas, and it isn’t a secular holiday. Right Karen. The general idea of respecting the differences means you should find a way to wish people well. Unless you know the holiday they celebrate, happy holidays, seasons greetings, etc seems the best way to go. I wish you and your family a great Hanukkah Karen! Thanks Dave! I hope your family has a great holiday season! I think that we need to do what is good for you. I work with people who are nasty about the whole business. Yeah, I just don’t get the being nasty about it, that’s what has bothered me in the past. Other people set this nasty tone & then I feel like reacting… my redhead stubborness can show. LOL! That’s why I am glad I got it written before the deluge got to me. I agree with you 100 % Janice.. Proud to call you my friend and sure that the early church going helped form your enlightened understanding. It’s a good reason for folks to get their children a sound religious foundation instead of what they may find being touted by fringe elements. Agreed though I have to confess some of the nastiest points on this have been from people who like to think they are religious but it seems different faith than what I was taught. Amen, sister. I couldn’t agree more. Have a fabulous holiday! Our country was founded on freedoms and one of those is freedom of religion, not from religion, as some people promote today. I think we should not be fearful of wishing our friends a Merry Christmas, particularly since this year, Hanukkah is already over. No one need take offense to that. You are just wishing them a happy season. I agree, there is nothing to ear in telling friends Merry Christmas. For me, the respect thing comes more with general public. I just don’t assume everyone is Christian so in those cases I say happy holidays. When we wish people well, we are wishing them something of ourselves that brings us wholeness. therefore, we can only give them what we have within us. My spirit is steeped in the love of God in Christ. That’s who I am, and who I am is what I have to give. I can only wish what’s mine to wish: a Merry Christmas. I wish it, not in a legalistic sense of “believe in the birth of Christ, or else,” but from a sense of wanting to share the joy that is within me, as informed by God With Us. And I say it with full respect for others and who and where they are. I’m not Jewish, and I don’t have Hannukah in my heart. Neither am I atheist or agnostic, so I don’t have either a spirit uninformed by faith, nor do I have a “generic” spirit. As much as I respect other beliefs and no belief at all, I cannot wish other than what I have in myself to give. To offer what is not within me would be shallow and insincere, because it’s not really mine to give. That’s why I have no qualms about wishing everyone a Merry Christmas — no matter who they are or what they believe (or not). When someone wishes me “happy holidays,” I accept it graciously, and I hope others accept my own wishes in the same gracious spirit. I understand what you are saying, just see it differently and for me, the biggest thing is some of the nastiness i have seen around hating on folks saying happy holidays. That venomous reaction has no place in my version of Christianity. great comment…especially the last paragraph,,…i feel nails it…..
Great post Janice! I usually say Merry Christmas but I often think of Thanksgiving through New Year’s Day as the Holiday Season. Hope you have a Merry Christmas! Its all good to me! Merry Christmas Val! Really enjoyed your blog! May I use the picture with all the holiday greetings on it on my Facebook page? I just love it! Sure. Glad you like it. I love your blog post! I use to work at JoAnn’s craft store and had to use my best judgment on which greeting to wish my customers. I often would try to converse with the customer as to try to figure out which holiday if any they celebrated or I simply went by the items they were purchasing. If they purchased Hanukkah (which there is not many and often voiced my customers issue with that on to my mang’t team and on to corporate), I wished a Happy Hanukkah, if they purchased “Christmas” items, I wished a Merry Christmas and when not sure a simple Happy Holidays and I got the most joyous responses from wishing happy Hannukka and merry Christmas and that i was brave to do so. I thought I wasn’t brave but more observant and respectful. Thanks so much for sharing that! I love that you are looking to connect with people and be respectful. That’s a passion of mine and really goes toward making people feel valued!